It’s the final day in my seven day dinner inspiration to help you get back into the routine of cooking for the family after the school holidays. Today’s dinner is Black Bean Nachos, a vegetarian dish packed with vegetables and flavour. It’s also a one-pot dish and a favourite in our house! I had never really had black beans until visiting Brazil a few years ago and really loved the traditional dishes made with them. I used to make bean nachos with red kidney beans (which works fine) but I love the taste and texture of black beans more in this dish. Black beans are high in protein and high in fibre. I often keep the leftovers (if there are any) for school lunches, warming the bean mix and sending in a thermos. Saute the onion, garlic, chilli, capsicum, zucchini, chopped coriander stalk, ginger and sweet corn for about 5 minutes in a large pot until softened. Add the cumin and paprika powders, tomato paste, crushed tomato and beans. Simmer over a medium – low heat for 20 minutes until thick and rich. Season with plenty of black pepper, stir through coriander leaves and juice of half a lime. 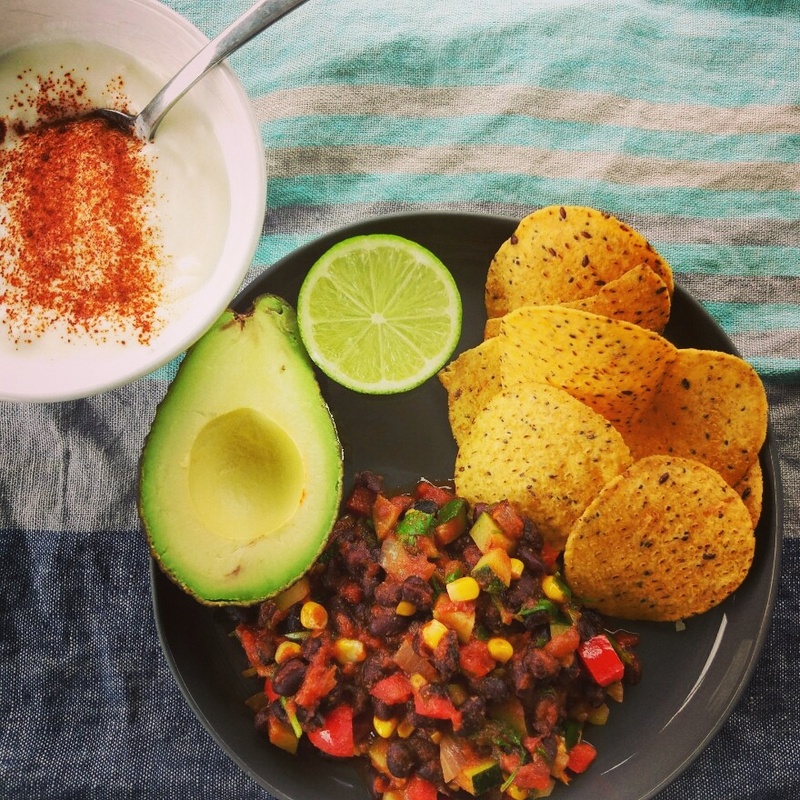 Serve topped with avocado, a side salad, a few organic gluten free corn chips and yoghurt.